With the recent reports that The Weekly Standard, once a highly lauded conservative magazine that turned into a home for NeverTrumpers in 2016, is preparing to shut down permanently, we note the similarities between them and liberal #resistance news outlets like CNN, who is suffering their own ratings apocalypse, and it comes down to more than "disagreeing" with the President, but rather a case of irrational, blind and rabid hatred. 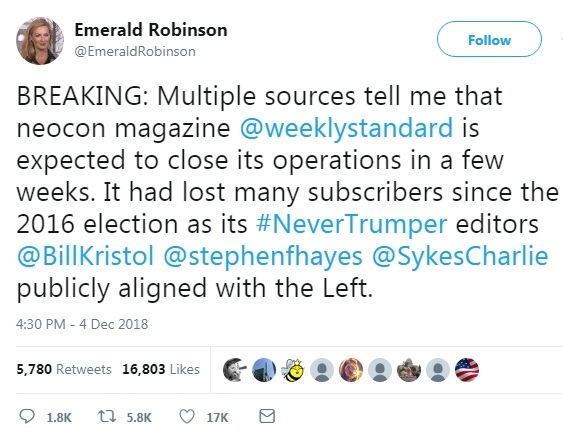 Emily Robinson from One America News Network helped break the news on her Twitter feed on December 4, stating "BREAKING: Multiple sources tell me that neocon magazine @weeklystandard is expected to close its operations in a few weeks. It had lost many subscribers since the 2016 election as its #NeverTrumper editors @BillKristol @stephenfhayes @SykesCharlie publicly aligned with the Left." NeverTrumpers are establishment conservatives who decided they would rather vote for Hillary Clinton, or not at all, than to see Donald Trump become President of the United States, not because his campaign promises were not conservative enough for them, and despite the fact that Trump's list of Supreme Court possible nominees were exactly who those conservatives would have chosen, but because they hated Donald Trump. Policy was not a consideration in many cases, only who Donald Trump was. He wasn't religious enough, he wasn't moral enough, he said what he wanted, when he wanted and wasn't "presidential" enough for their liking. One of those NeverTrumpers was William (Bill) Kristol, one of the founders of The Weekly Standard in 1995, along with Fred Barnes. Kristol is still listed as Editor at Large for TWS. Kristol had reportedly said back in 2016 that he would rather see Hillary Clinton in the White House than Donald Trump. Kristol pushed for a brokered convention and then wanted a third party candidate to run if Trump became the GOP nominee, splitting the Republican vote which would have given the election to Clinton. Kristol and the Weekly Standard's demise is but one example of how blind, rabid hatred of one man, is destructive. In TWS' case, the destruction of a magazine that was a staple for conservative political junkies from 1995 until they allowed their Trump Derangement Syndrome to destroy their credibility. NeverTrumpers like Kristol, Max Boot, and Washington Post's so-called conservative Jennifer Rubin,, among others, will claim they are simply sticking to "principles," but in many cases they have flipped their long-held positions on huge conservative topics, simply to oppose President Trump, or "resist" him, much like the far left liberals. One prime example of this is Jennifer Rubin, who was taken to task back in December 2017, by National Review's Charles Cooke, for her ever-changing positions, not based on any "principle," but based on who was the President. I use Cooke's criticisms of Rubin for a reason. Cooke is not exactly a fan of President Trump's and is as likely, or more so, to criticize President Trump as he is to praise him on policy, while still adhering to his prior positions on issues, and is able to acknowledge policy decisions he agrees with, without throwing in an ad hominem attack, every other sentence. In other words, unlike the others, Cooke is able to put his personal opinion of Trump the man to the side, to discuss Trump the President. Cooke is a Trump critic, but not so blinded by rabid hatred as to allow his dislike to discredit his work. NeverTrumpers on the other hand are exactly like their liberal counter-parts in the #resistance, in that policy doesn't matter, conservative goals and issues don't either, all that matters is resisting anything President Trump does, at all costs. Most all the well known "conservative" NeverTrumpers have the same "tone" in their articles, and even can be seen in their social media feeds. The attitude of we are "true" conservatives, as if anyone that disagrees with them are not conservative at all. As most were highly influential in the past, much like the establishment media, they almost always give the impression that they "know best," and the rest of the conservative peons should listen to their betters. 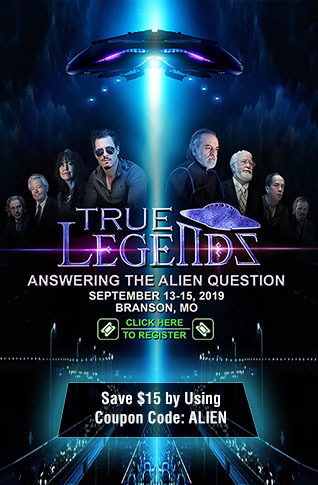 Their waning influence, their inability to prevent Donald Trump of winning the 2016 GOP nomination, and the inability to wield their influence to prevent him from being elected President, appears to have left them angry at those that supported Donald Trump, or even just voted for him over Hillary Clinton when those were the only choices left, and that bitterness can be seen in almost everything they write and say in interviews. Look, NeverTrumpers have the right, the obligation even, to vote according to their own beliefs. What they don't seem to understand, because they are blinded by hate, is everyone else has that same right. Listening to them or reading their work, one often gets the impression of a parent lecturing their grown children on what they should or shouldn't be doing. Trying to regain their influence by opining on reasons why one should be allowing their "intellectual betters" to guide them and tell them who to support, what they should be prioritizing, what should be important to them. We often see the so-called #Resistance on the left, and Nevertrumpers on the right, cast blame on President Trump for dividing the nation, without seeing the irony of their own blind and rabid hatred seeding those divisions. The criticisms from both groups often mimic each other. As seen above, those "principled" conservatives are more than willing to be funded by liberal groups, even those connected to George Soros. They would rather lie in bed with pro-abortion, gun control radicals, than to accept that the majority of Republicans disagreed with their establishment, political class opinions, and voted for President Trump in 2016. Also like those liberal resistance radicals, they are continuing to have their 3+ year temper tantrum against our President, and in the case of the Weekly Standard, we see the destruction it can cause. The bottom line here is there is nothing wrong with criticizing President Trump when one disagrees with his policy decisions, nor is there anything wrong with praising the choices we agree with, but allowing blind, rabid hatred to steer your ship, will eventually sink that same ship. Authors Note: While I stopped reading the Weekly Standard years ago, which is a valid choice in a free market, and I may dislike that the magazine and their writers became so full of vitriol, it is still heartbreaking to see so many be affected with the potential loss of their jobs, especially at this time of year.